Boost energy and motivation. Get access to nutrition tips and workouts. And, discover new places to get into shape during the Get Fit Challenge from Sept. 22 to Nov. 3. hosted by Health Quest. Get Fit participants can also win healthy prizes, like a spa package, sporting goods items of their choice and fitness apparel, when they log at least 30 minutes of physical activity at www.WeGetFit.org. The six-week challenge is a community wellness program has grown to include more than 180 check-in fitness locations in the mid-Hudson Valley and northwest Connecticut. 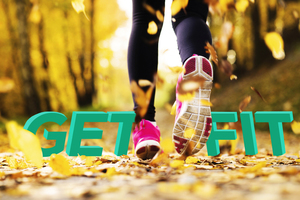 Any type of fitness activity at eligible gyms, parks, rail trails, nature preserves and more can be entered at www.WeGetFit.org. Or, there are weekly workout routines that can be done anywhere, anytime. New to the challenge are more than a dozen added check-in locations in northwest Connecticut and long-sleeve Get Fit swag. The spring challenge resulted in more than 10,000 logged exercise sessions – a record number since the program began in 2014 as the Walkway Fitness Challenge. Grand prize winner Alicia Gonzalez, a resident of Beacon, logged more than 25 sessions in last spring’s six-week challenge. “It was inspiring to see how my mood and energy changed after a few weeks of working out. It has definitely kept me motivated to keep going,” said Gonzalez, who won a spa day for two at Mohonk Mountain House as well as a weight set. Second-place winner Melissa Vermeulen of Poughkeepsie was involved in a car accident a couple months back and said Get Fit allowed her to focus on the types of activities she could do while in recovery. “I love to go for walks and hike. So, I focused on that and went to sites I’ve never been to before like the Appalachian Trail,” she said. Vermeulen was awarded a vehicle bike rack as her prize. There is no cost to take the challenge and set up a profile for logging activities online. The website keeps track of fitness activities and automatically enters the participant into prize raffles. The more sessions logged, the better the prizes.